Bahrain’s king, Hamad Al Khalifa, ordered troops and tanks into Pearl Square in downtown Manama in the early hours of Thursday morning. They fired tear gas, rubber bullets, and used batons to clear the hundreds of demonstrators who had decided to stay the night in the square, killing four protesters and injuring 95. About 50 tanks were reportedly on their way to the site on Thursday morning. On Wednesday, thousands of protesters had come out to mourn the second of two dissidents who had been killed by police repressing earlier demonstrations. Then the military decided to move in to crush the dissident forces. 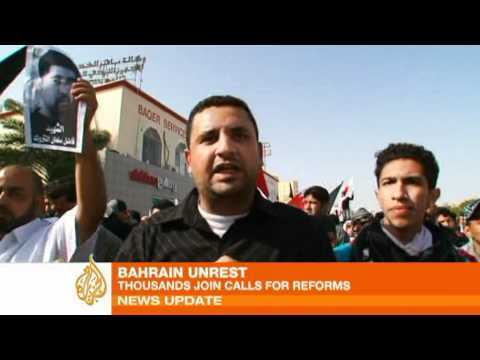 The differences between Bahrain on the one hand and Tunisia & Egypt on the other are legion. But the strong ethnic and sectarian divide between the minority Sunni king and the majority Shiite population is key here. The military that crushed the mostly Shiite protesters on Thursday morning is Sunni. The secret police are Sunni (and sometimes even expatriate Pakistanis & etc.) If the Shiites got what they wanted, i.e. more democracy and a weaker monarchy, then the interests of the Sunni ruling class would be profoundly endangered. In Bahrain’s case, the interest of the Saudi state in backing the Sunni monarchy, and fear that the Shiites would favor Iran, complicates the story regionally. Saudi Arabia is very wealthy and very nearby (a causeway connects the main island of Bahrain to the Saudi mainland, across which Saudi expatriates come in, and act as a support for the king against his own Shiite population). Tunisia and Egypt are much more unified populations, mostly Sunni and Arab. The military in neither place was afraid that if the strong man was overthrown, some alien ethno-sectarian group might take over that would imperil the prerogatives of the existing Establishment. Nor were there big regional geopolitical divides, though of course the far rightwing Likud government of Israel preferred that Mubarak remain as strong man. It was not powerful in Egypt, however, while Saudi Arabia is powerful in Bahrain. Both Tunisia and Egypt were class-based movements, protests of the blue and white collar workers. While economic grievances are important in Bahrain, they are being reworked as sectarian grievances, since most of the rural and small-town poor are Shiites. There is still no guarantee that the Sunni government will succeed in repressing the movement of the Shiite majority for more democracy in Bahrain, but determination to use force against protesters does raise the cost of activism significantly, and sometimes can tamp it down.